On 1st July 2009, we officially move into our newly bought house. The house is moderate in size, has a nicely renovated living room and kitchen space and of course a very conducive air circulation (this is what I like most). It just nicely accommodate our current needs, alhamdulillah. We decided to buy this house after conducting several, critical surveys, discussions and meetings with few owners. Definitely, for time being, this is the best choice for us. We should extend our heartiest, big THANKS to mak, alang, ami, ateh and mie for helping us to move in to the new house. Yes, me and my husband still owe them a dinner treat at C**N* *O (guess what?). Now, it almost one month since the 1st day we moved in here. Few things should be taken care of especially before Ramadhan begins. I might say that this has been a strong reason on why I rarely update my blog recently. 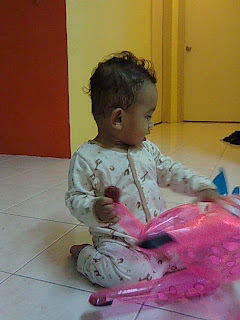 (p/s: Izz is busy with the toy at our new house).